This is your opportunity to demonstrate to the national judges why they should consider you for the job of Miss America. You may list as many or as few items under each category as you desire. Your only restriction is that it must follow the established format and it must fit on one (1) page. This page, combined with the Platform Statement, will comprise your entire application for this job. The judges will receive exactly what is submitted. Any item incorrectly submitted that does not fit the established criteria may be submitted to the judges without an opportunity to correct. Create a “New” document with your computer’s Word program. Set margins for 1" on all four sides. The font style may not be any smaller than “10” and no larger than “12” point type, using the Times New Roman font style. Please refer to the attached sample to verify you are following the requested format. With the justification set for left, type “Name:” in bold. Following the colon (:), hit the space bar twice. Then, type your name as you wish the judges to know it. (If your name is LaCricia Deborah Smith and you want to be known as “Deborah Smith”, please type “Deborah Smith). Then, move to the next line and type “Title:” in bold. Following the colon (:), hit the space bar twice. Then, type your state title. Then, move to the next line and type “Hometown:” in bold. Following the colon (:), hit the space bar once. Then, type your hometown including the city and the state. Move Justification to the left. Double space down and type “Education:” in bold. Hit the tab bar three times and then type your most recent school first. If it is grad school, indicate it as such. List degree seeking (all on the same line as the name of the school), move to the line underneath that to list your undergraduate school and degree sought/achieved, and below that list your high school. Double space down. Hit the tab bar once. Type “Platform Issue:” in bold. Hit the tab bar three times. Type the TITLE of your platform, MAKE SURE IT LINES UP WITH THE INFORMATION ABOVE IT. DO NOT TYPE ANYTHING OTHER THAN THE TITLE. Double space down. Hit the tab bar once. Type “Scholastic/Career Ambition:” in bold. Hit the Tab bar once, MAKE SURE IT LINES UP WITH THE OTHERS ABOVE IT. Then type the type of degree/education you would ultimately like to achieve and beneath that, list your career ambition. Double space down. Type “Scholastic Honors:” in bold. Hit the space bar twice. Each item should be separated by a semi-colon (;). Double space down. Type “Leadership Roles:” in bold. Hit the space bar twice. Each item should be separated by a semi-colon (;). Double space down. Type “Accomplishments:” in bold. Hit the space bar twice. Each item should be separated by a semi-colon (;). Double space down. Type “Interesting Facts:” in bold. Hit the space bar twice. Each item should be separated by a semi-colon (;). Double space down. Type “Employment:” in bold. Hit the space bar twice. Each item should be separated by a semi-colon (;). Double space down. Type “How has the world you come from shaped your dreams and aspirations?” in bold. Hit the space bar twice. Please answer the question in sentence form. Double space down. Type “Of all the ways you could succeed in your life, why have you chosen to succeed in the Miss America Competition?” in bold. Hit the space bar twice. Please answer the question in sentence form. Double Space down. Type “What social issue, other than your platform, will have the greatest impact on your generation and why?” in bold. Hit the space bar twice. Please answer the question in sentence form. Use your best judgment on what is most important for the judges to know about you. Use the space wisely. 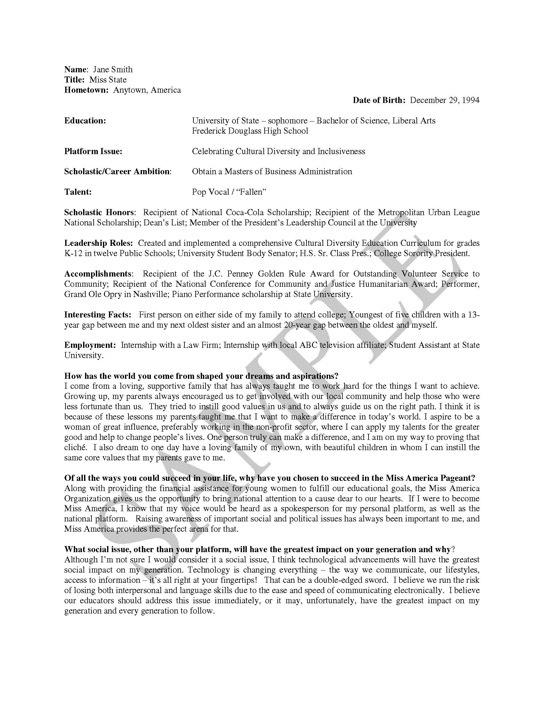 Attached is a resume example you can use as a guide. The entire form must fit on one (1) page using the Times New Roman font style. You must leave a 1” margin on all four sides of the page. If spacing issues arise, simply follow the example provided. This form is given to the judges with your platform statement. You will notice there is a REQUIRED SIGNATURE LINE at the bottom of the Platform Statement. When these two pages are put together, they will create your entire application. Your signature covers the materials listed ON BOTH PAGES. Your signature verifies that everything on the forms you submit is true and accurate. If it is proven that any information on these forms are not true, correct and factual, you risk disqualification from competing in the National Competition and losing your state/local title.